I finished my log cabin blanket last night. This blanket began with leftover yarn from four entrelac felted bags (pattern and yarn from knitpicks.com). After a while I ran out of leftover yarn, and had to buy more to keep the blanket going. 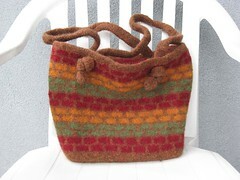 Then I got sidetracked when I designed and made three felted slip stitch totes last spring using the yarn I bought for the blanket. That meant I had to buy more yarn, again. As I got close to finishing the blanket, I used leftover yarn from the blanket to make socks, and Pippi. I had to dip into the blanket’s last ball of hollyberry (red) to finish Pippi. And when I finished binding off the last log on the blanket in hollyberry, I only had one yard left. That was close! I didn’t put on an edging. I’m leaving open the possibility of making it bigger, somewhere down the road. For now, it’s a nice snuggly hanging out on the sofa afghan. I love how this turned out. The colors make me really happy! 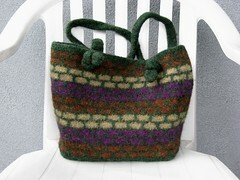 This entry was posted in Knit and tagged Knit, knitpicks, log cabin blanket, mason dixon knitting. Bookmark the permalink. Oh, that is gorgeous! Good job! I love it, of course someone in my house would wash it and it would felt, LOL. But I love it just the same. The colors are like they were made for each other. You take the best photos! The blanket looks great! It’s beautiful! I’m always impressed by people who knit blankets. I really don’t have the patience for anything bigger than a baby sized one. I’ve started and then frogged quite a few. I love it! We’ll have to have knit night at your house again so I can snuggle with it! It looks amazing! I love your color combinations. And hey, now you know you can hang out on the sofa in your hat and socks with your bags surrounding you and you’ll coordinate with your blanket. It’s gorgeous! And I definitely love the colors. Those are so my colors. And how cool that the same yarn sparked ideas for so many other projects in the process! *Love* the blanket! 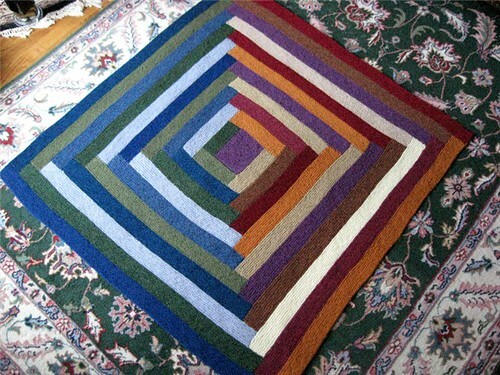 I’m thinking about digging into a major commitment project – perhaps the log cabin blanket or Great American Afghan. A great way to use remnants!! 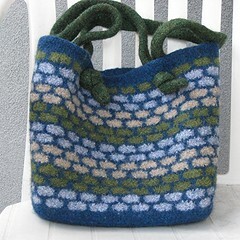 I really need to check out those slip stitch bags – they are great!!! 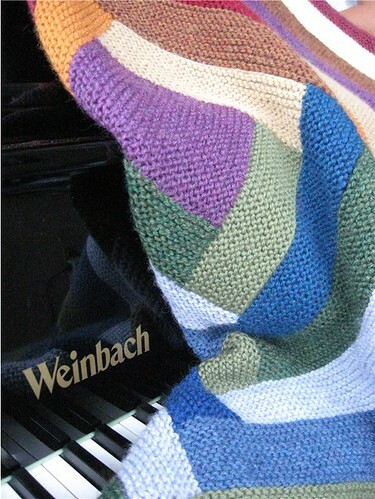 The blanket is beautiful – what great colors! Congrats on getting it done! And the other projects that you did with the same yarn are gorgeous! The blanket is so cozy looking, it makes you want to pick it up and cuddle it. Leaving your options open on it was a wise choice, you never know when you may want to augment a project. Nice knitting! Looks great! Finishing something that big always feels so good. Enjoy the blanket and being done with it! All your knit items look beautiful. I really like the rich colors you chose. I love it!! The colors are fabulous (and thank goodness you like the yarn, right!). Oh, I need to get cracking on finishing my log cabin blanket! All of tho projects are gorgeous. I love the throw and the ballband totes are incredible! Good idea on the lack of edging! Ready to convert that into a king sized blankie! It looks just beautiful! Congrats!!! 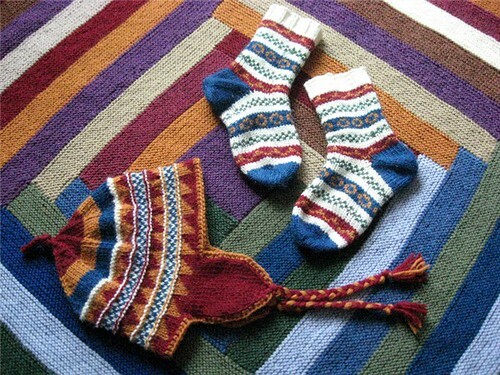 I absolutely LOVE your knitting and the colors that you put together. I’ve started a log cabin afghan but now I’m going to frog it and use yours as an inspiration. Thanks so much for sharing you photos and talent with us. The blanket is gorgeous! I love all the other things that have been born out of the same yarn, too. I’m inspired. I’m going to knit an afghan for my son to take to college and this has just complicated my pattern choice. I was thinking of the Mason Dixon Moderne Log Cabin, but this one looks really good! Your Log Cabin blanket is beautiful. I’m thinking of starting one also. Love it! Gutsy move to use all/both sides of the color wheel. It’s stunning!